It was 25th April noon. I was heading back home by train and got my phone out to check the notifications. A post on my Facebook timeline made me unconscious and even forgot what to do for like a minute. It brought me the news about the tragic earthquake happened in Nepal. For the next couple of hours I was busy with trying to contact my friends from Nepal and checking whether they are OK…The phone lines in Nepal were not properly working due to network failures. It was very hard to find out whether out friends and colleagues are secured. During this disaster situation, the social media did a tremendous job by establishing communication channels as well as getting out the news from the affected areas an spreading them out worldwide. Here I’ve listed out some social media and technological interventions came out as a relief for the victims of the disaster. Tweeting birds carried the news as fast as they could! As I noticed Twitter was the fastest channel of carrying out the news about the situation in affected areas .Tweets from the verified news sources even became news sources for local news channels. With the help of hashtags it was easy even for the public to grab the info about the disaster. Here the graphs shows how vital #NepalEarthquake was during the situation. Recognizing its importance as a tool for coordinating relief efforts, and as a backup for official channels of communication, Twitter says it will be concentrating its efforts in that direction. Facebook; the giant of social media in the mission! In my case, My Facebook timeline was the first news source about the disaster for me. As many people were sharing news and posts about the earthquake, my Facebook timeline gradually became a news line. Facebook Safety Check feature which was implemented after the 2011 Tsunami in Japan, was activated aftermath of the 7.9 magnitude earthquake that struck Nepal. 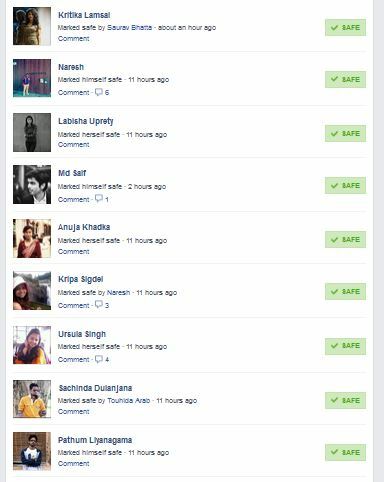 Facebook’s Safety Check invites users to “mark themselves safe” if they are in the earthquake affected areas. Users can also check whether their friends are currently in the affected areas and if they have marked themselves safe. It is quite good to see that people using social media channels for the social goodness. If it is about computers, Google is there! 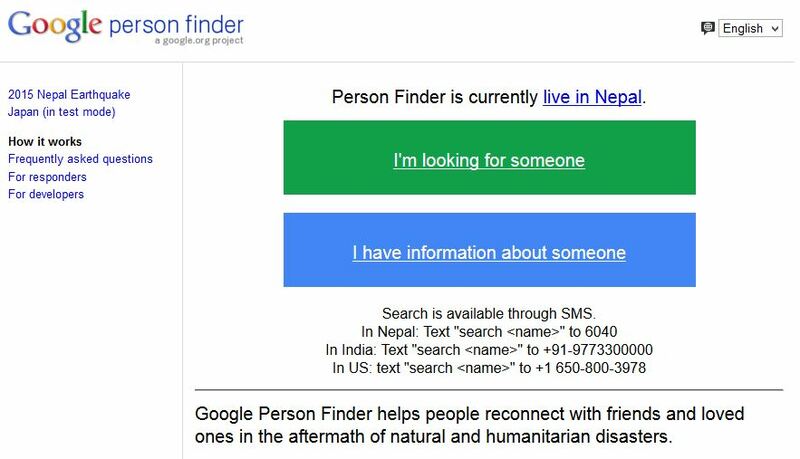 Google too has activated their Person Finder tool that was launched in the aftermath of the 2011 Haiti earthquake. It is an open source API that lets people create a ‘record’ of themselves. It allows to track the whereabouts of their friends and family and subscribe to updates about people’s locations. The tool also lets you embed it on your website to enable people to search or track people’s locations. I tried it with several entries, but for me it seems not so effective. Google should have develop further. As many mobile networks were down for several hours, the voice calling services like Viber & Skype came out with free call facilities to and from Nepal. 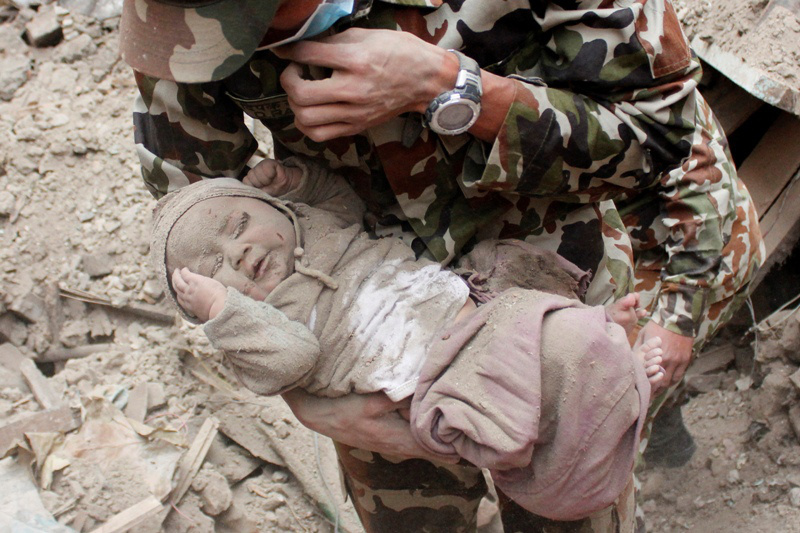 “In light of the devastating events that have taken place in Nepal – and the subsequent impact to the local communications infrastructure – we are making all Skype calls to landlines and mobiles in and out of Nepal free of charge,* with immediate effect.” The skype team expressed their idea in their blog making skype calls free. In this post disaster situation, many fund raising initiatives and help hand activities are going on with getting the help of social network reach. Those campaigns seems effective as millions of people engaged with social networks are clicking the like buttons and share the posts about a disaster even without having good sense. Technology should always for the social goodness. Though social networks are pointed out as social beasts, here in a disaster situation they can act a vital role helping the victims using its tremendous reach and availability. Will the social networks be the next disaster alert system?